Taste test: These chips were crisp and had a nice pickle taste. A few of the chips in the bag were on the large side. Some of the chips had a stronger pickle zing than others, but generally the zing was not super-strong. 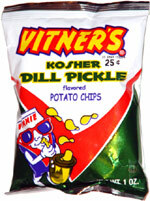 Vitner's packed an average number of chips into this small bag. A good pickle chip. Smell test: Good but mild pickle smell.